According to Traditional Chinese Medicine imbalances and blockades in the energy flow are the cause for the development of diseases. Internal as well as external circumstances of life lead to those blockades – like, among other things, an unhealthy diet, environmental toxins, unhealthy habits, long-lasting stress, anger, dissatisfaction, envy and rage. Authentic Qigong always aims to dissolve blockades and to stimulate the unhindered flow of the energy “Qi”. Therefore it is the ideal method to prevent the development of illnesses, or to heal accrued diseases by oneself. The exercises help to receive fresh energy. Once the blockades are dissolved, consumed energy, toxins and ballast can flow out of the body. A free flow of Qi, in the Meridians, results. The emotional condition is being harmonised and the exchange between body and mind is undisturbed. Qigong is based on exercises in silence and exercises in motion, on a natural breathing and on positive thoughts. The exercises are easy to learn, they contribute in a simple way to overcome physical and mental suffering. Even the course of serious or chronic illnesses can be affected positively in many cases. Other positive effects are the increase of the personal performance, a deep relaxation, an effective stress reduction and the prevention of premature aging. Qigong exercises can in practice be accompanied by visualisation or healing sounds to enhance the effectiveness. 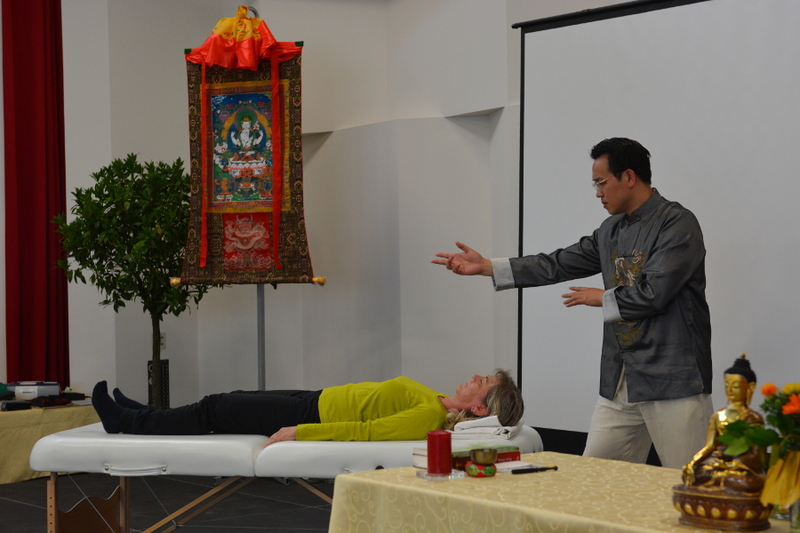 An outstanding feature of some few authentic Qigong systems is the energy transmission. Thereby the experienced Qigong practitioner serves as an open channel through which healing Qi can flow into the Meridians of the sick or blocked person and by this he or she is able to dissolve the blockades. This extraordinary pleasant energetic treatment is experienced by the patient as a feeling of warmth, a tingling or simply a pleasant relaxing effect. The transmitted energy can work as an internal or even an external conceivable impulsive movement. Preconditions for the energy transmission are the guidance and enabling of a Master, a high moral integrity of the performer and trust on the side of the receiver. The effects of Qigong predestine the using in medical treatments even with serious illnesses. 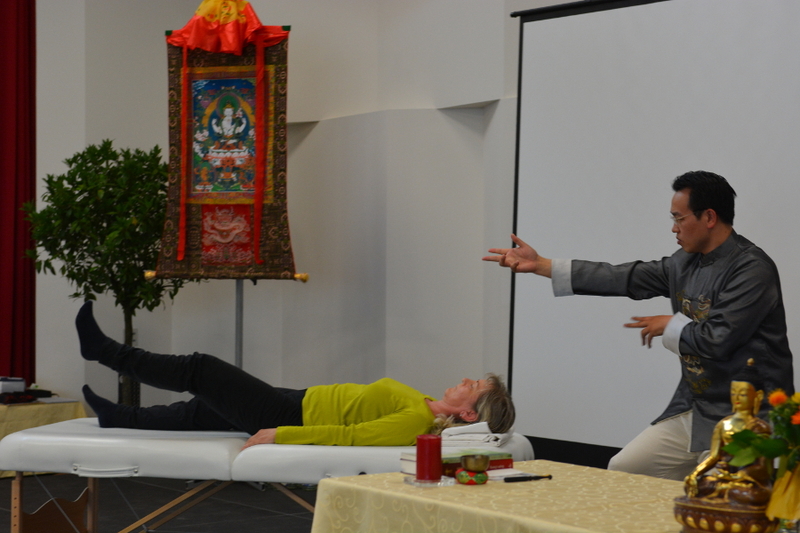 Thus oncological treatment centres, like the University Hospital of Essen, have opened up to this kind of treatment approaches and have included Qigong with great success into the treatment spectrum of serious oncological diseases. The intensive effect of Qigong exercises has by now arrived in many areas, where high performance, endurance but also social competence and leading qualities are important. Managers, top athletes, musicians, attorneys, artists, engineers – many professional groups rely on the effect of authentic Qigong. There already is empirical research on many levels about the effectiveness of Qigong exercises. At this the evaluating clinical reports prevail. The clearly positive reviews of the participants have resulted in the inclusion of the exercises in the treatment concepts of numerous clinics and rehabilitation facilities. Many of these studies indicate a stimulating or a modulating effect for the immune system. The empirical research findings in the field of geriatrics are also well known, for they show that Taijiquan exercises, which may be classified as a simplified subtype of the Qigong exercises in motion, can lower the tendency to fall of the elderly to a very high extend. Recent studies focus on the effects of Qigong with pupils who have attention deficit disorder. Moreover in China imaging techniques (e. g. thermography) were applied, which could proof that Qi can show visually by a higher temperature. In terms of critical research it remains to hope that in the future there will be a systematic research regarding the mode of action and the types of effects of Qigong in a quantitative larger amount of samples.